And so we come to the end of our "Best Game Music of 2011" series, where tradition dictates we crown a victor. I'm only half-serious, of course; it's all but impossible to say what the best anything is, and that's doubly true of something as ephemeral and subjective as music. But all the same, Jim Guthrie's soundtrack for Superbrothers: Sword & Sworcery EP was hands-down my favorite video game soundtrack of the year. It was at once dark and brooding, mysterious and beautiful. Guthrie's mix of undulating synthesizers, grinding and looping square- and sinewaves, plunking guitars, and human voices moved in lockstep with the game's naturalistic art style and enigmatic atmosphere. 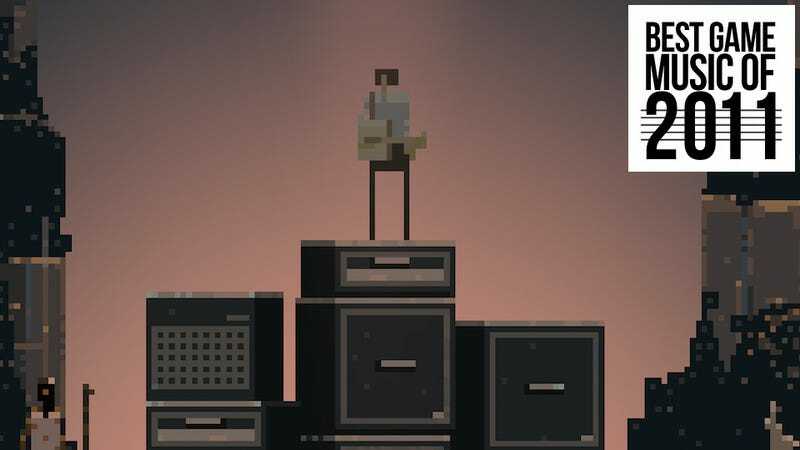 Sword & Sworcery was designed around Guthrie's music just as surely as it was around its puzzles, art and story. It was this tight, soulful artistic harmony that made S&S EP my favorite game of the year, and my nomination for Kotaku's Game of the Year. Is Sword & Sworcery EP Kotaku&apos;s Game of the Year? A terrific developer post-mortem in Game Developer magazine (Vol. 18, No. 08) offers some more insight into the process of creating the game. The article was written by Adams, with input from both Guthrie and Kris Piotrowski of the Toronto game design studio Capybara Games, who make up the third part of the S&S EP design triumvirate. S:S&S EP was initially conceived of as "a record you can hang out in," and it was primarily inspired by a collection of previously unreleased musical compositions by Jim Guthrie. As the project progressed, Jim was called upon to score an absurd number of hard-to-describe moments, all of which he handled with aplomb. With the musical voice of the project as a starting point and the artist style of Superbrothers already established before the project began, the next step was to decide on a time, a place, and some characters to wrap around the vague ideas we had in mind. The key thing to take away from that is that the music and the art were the starting points for the game itself. So often in game design, mechanics and systems create the framework, and the story and music are grafted on later. I'm not suggesting that isn't a perfectly acceptable way to make a great game—after all, Portal 2 is built around a gameplay mechanic, and look how great its music turned out. And so I sat, kicked back in a chair in my darkly lit apartment, ensconced in the tiny, beautiful world transmitted to me by this glowing thing I held in my hands. But it's telling that the guys making Sword & Sworcery sat down and said, basically: "We've got all this awesome music. We've got this groovy art. So… how can we make a video game around it?" The resulting product is a messy mystery, an interwoven wonder that has yet to stop delighting me after two playthroughs. It's funny and laid-back, cool in a way that games rarely are. That self-assured artiness was actually off-putting to some, but I'm confident that any who give the game a chance will eventually be won over by its earnest charm and its wholehearted embrace of aesthetic beauty. Sworcery pulls together ideas we've seen before—in point-and-click adventures, in The Legend of Zelda—and combines them with new ones to create something fresh. It's the little things, uncommon choices that say as much about game design as about this game's design. Your character is a woman; it's not a big deal, she just… is one. As you progress through the game, she gets weaker and weaker, so although the final boss isn't some overblown super-boss, it is still more difficult than the first boss was. The game uses the iPad's clock to make the in-game moon mirror the moon in real life, and some puzzles require you to put the thing down and wait a couple of days before you can solve them. The characters maintain twitter accounts that offer puzzle-clues and insight into their current state of mind. Even the dog likes to tweet: "Bark, Bark." Sworcery also brilliantly took advantage of the of the inherent intimacy of the iPad. This was a game that required that you hold it, touch it—at the outset, players were instructed to wear headphones, and I sure couldn't imagine playing it with the sound turned off. And so I sat, kicked back in a chair in my darkly lit apartment, ensconced in the tiny, beautiful world transmitted to me by this glowing thing I held in my hands. Mr. Guthrie himself was kind enough to give me some background on how he crafted each of the tunes for the game, and I'll be talking about my seven favorite below. If you haven't played S&S EP, if you're skeptical, or even if you don't have an iOS device (it's also playable on iPhone) and can't play it, I still hope you'll put on a pair of headphones and give these tracks a listen. Let's start with "Lone Star," which is the first song to make an appearance in the game. I have no idea what sound is generating that weird scrubby/clicky beat, but I love it. This tune embodies Guthrie's sophistication as a soundcrafter, for lack of a better word. It's a fairly simple four-chord chord progression (until it hits that triumphant B section), but the beat is a marvel of rhythmic composition. The panning of that skittery, metallic beat leads into that weird shaker-sound that comes in alongside the melody. Check out the triplet-infused clavé it lays down under the first melody statement—you wouldn't even notice it unless you were listening for it, but it adds a sense of driving latin double-time to what is in fact a laid-back, 4/4 groove. This song hints at the promise of the game—the Scythian is accompanying Logfella up a hill to retrieve the Megatome, preparing to set into motion the woeful events of the rest of the game. Logfella, you may recall, is "not super jazzed" about any of this, but he goes along, because Logfella is a super good dude. And all the while, this song plays. This was an older piece that I retro fit with the game in mind. I actually had people play over it without hearing how the tune really went. I told them the key of the song and had them play to a click track. I also had them musically acknowledge some sort of build but it was pretty abstract. I ask some to play real loose and improv and others I asked them to build a chord or a pad with whatever instrument. Jeremy Strachan played sax. Owen Pallett played violin and Mike Olsen played cello. After I collected everything I went to work editing it all and laid down bass, guitar etc. I had no idea where it would fit into the S&S experience and in the end I think having really only play in the menu screen was a great choice. Epic in its scope as it is humble in its beginnings, the sweep of this melody gets me every time. Those immense low sampled strings, the building beat, the layering counter-melodies… that final repeating major-scale melody. It never stops building, never stops developing. Pieces like "Under a Tree" are what put S&S EP on a different compositional level than other video game soundtracks. Believe it or not I used a Sony Playstation (PSone) and MTV Music Generator to make a few of the songs on the S&S album. MTV Music Generator is a brilliant program and it was my first foray into programming synth music. The synth sounds in the program have an incredible quality to them. I just released a record (Dec 21) of all of my Playstation compositions on Bandcamp and iTunes. The album is called 'Children of the Clone'. Got that? He just released a new record using these same PSone tones, and you can buy it on Bandcamp. Sword & Sworcery EP is in many ways a spiritual homage to Zelda, and so it needs a "Triumph!" song like the fanfare in the original game. When the Scythian picks up one of the pieces of S&S EP's Trigon, this music begins to play… starting with dripping atmospherics as she picks up the Trigon piece, holds it above her head... and the beat drops. If you're anything like me, your resulting fist-pump/glory-hand is almost unconscious. Guthrie says that he didn't go into this piece intending to create such triumphant fanfare, but that it fell together more organically. More time then not I'll start off trying to create something totally different but then after a few happy accidents I find the song leading me a direction and I have no choice but to follow. I just knew I wanted big chords to come crashing down and a phat beat. Sometimes that's all you need! "And We Got Older" plays during one of my favorite bits of the game. As the Scythian wanders a dream world, she comes across Jim Guthrie himself, sitting in a glen of trees and noodling on his guitar. If you sit down with him, he begins to play this song, and players can tap out notes of the corresponding minor pentatonic scale by touching the surrounding trees. It's a lovely bit of interaction, and allows us to make the game personal in a small but vital way. As the song develops, a warm, pink glow emits from between the Scythian and Guthrie. The music heals her wounds. If there's one thing I could use more of in my music is DISSONANCE! I love it but I can never bring my self to pull a tune in this direction and fully embrace it. I think every song could a little melodic chaos in this regard but I often go for "pretty" and I secretly wish I was more naturally dissonant. I did consider choosing "wrong" notes in this interactive part of the game but I didn't want to bum the player out...or something. It's funny you mentioned the 'major part' in the song because I was really pleased with how there were no wrong notes in the scale I chose until it goes major! Ahhhhh! A flowing river, the echo of a series of numbers; the howl of a wolf… I can't very well talk about this song without spoiling the ending of the game. But I'll talk around it - "Little Furnace" plays during S&S EP's silent epilogue, as we tour back through the game's small but rich world, past characters we've come to think of as friends, and reach the end of the tale. That first synth, sliding up to the major seventh (not the most consonant tone on which to begin a piece), opens the way for a growing, shifting composition that lets us say farewell to this beautiful world and accept the end of our woeful errand. "Little Furnace," indeed. This is another Playstation composition. The synths in MTV Generator are like no other synth I've ever used. They are surprisingly warm sounding for a Playstation game. There are a ton of really bad sounds but that's like any synth. It was very challenging at first to learn how to navigate all of the menus using only a Playstation joystick but now I'm really fast at it and I can get ideas down quickly. "The Ballad of the Space Babies"
And here we are at the last tune in this post, which actually isn't a tune from the game per se. But I'm so glad it exists. In the game, players must solve puzzles by "Singing a Song of Sworcery." The Scythian kneels down, and a white halo surrounds her. Your finger triggers a white cloud, a tinkling point of interaction that leaves a painterly, lingering trail as you slide it around the environment, something like a will o' the wisp. Different puzzles have different solutions—touching the waterfalls in the right order, finding the differences between a lake's reflection and the real world—but each time you touch one of the proper totems, a chime sounds. Those tones match up with the pulsing lower tone of the Sworcery itself, eventually revealing a magical sylvan sprite, who pops up from the ground. To complete the puzzle, you must touch the Sprite three times, and each time it emits a different "ooh," eventually soaring up to the heavens. The Space Baby voice is actually me. I sampled myself "ooo'ing" on an SK-1 and used the portamento function to get the pitch bend on it. I really can't believe I got that to sound the way it did. I don't recognize that sound as my voice at all. This is one of my favourite songs on the album but I have no idea how it came to be. It was sort of a gift from the recording gods. I've never made anything that sounds like it and I will never be able to recreate an atmosphere like it again. I'm fairly certain that I'm not the only one who didn't want the Song of Sworcery segments to end. I'd lazily drag my finger across the screen as the chords changed beneath me, highlighting trees and animals, listening to the chimes of my selections ringing out against that undulating backdrop. And when the sprite emerged, I would touch it once, twice, and then pause… until right in step with the music, I'd tap it that third time, sending it into the atmosphere and ending the song. This is what made Sword and Sworcery EP so special. Many, many video games are about magic. Very few feel truly magical. The Superbrothers: Sword & Sworcery EP soundtrack can be purchased direct from Bandcamp for $7.99, and is available on iTunes as well. And do yourself a favor and check out Guthrie's new album, Children of the Clone, created out of those beautiful PSone sounds. At last, we come to the end of our series. I have had a great time writing these music posts; thanks to everyone who commented and wrote in, to Luke and Evan for their contributions, and to the composers who took the time to chat with me about their work. Tomorrow, I'll put together our Readers' Choice post, recognizing soundtracks nominated by you guys for games I didn't have time to write about or that I didn't play. The Best Game Music of 2011: Make Your Readers&apos; Choice Nominations!